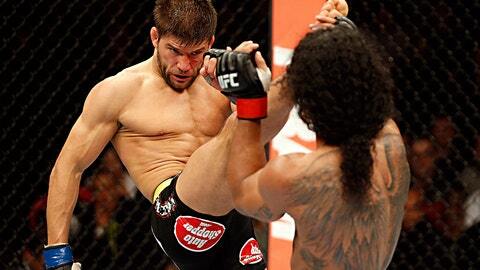 Josh Thomson has had a legendary career in MMA. Is it over? Josh Thomson’s night ended in controversial fashion, losing a close, split decision to former UFC champion Benson Henderson, and that may serve as the final fight of his veteran career. Following the fight, Thomson appeared at the FOX UFC Saturday post-fight press conference where he sat sullen in his seat, obviously shaken after losing not only the fight, but also his chance to fight for the UFC lightweight title. With a win, Thomson was set to fight champion Anthony Pettis, and now he ends up back on the pile of contenders all vying for a chance to get a crack at the top of the division. Prior to facing Henderson, Thomson said on several occasions how his training camp was more than three and a half months long and just did not go as well as he had hoped. Now coupled with a loss, it has him questioning his immediate future in the sport. "You train this hard for this long and it’s such a long camp and I just see my title shot f***ing disappearing. Without getting emotional right now, it’s really irritating me," Thomson said. You train this hard for this long and it’s such a long camp and I just see my title shot f***ing disappearing. Without getting emotional right now, it’s really irritating me. What really got to him, Thomson said, was the way he lost this fight, because when the final horn sounded he felt 100-percent confident that the victory was his. Despite breaking his right hand during the first round, Thomson still took the fight to Henderson throughout all 25 minutes and said he had no doubt that his hand should have been raised. Unlike his third fight against Gilbert Melendez in Strikeforce that also ended in a split decision, Thomson just can’t rationalize his loss to Henderson on Saturday night. "This might be it," Thomson said. "The Gilbert fight, that to me was a close fight, but I can see how it went either way. This fight I felt like I won. I won with one hand. I beat the former UFC champion, it was the guy who was here for two years, and I beat him with one hand. That’s what I can’t stomach. I’m a better fighter, that’s what pisses me off." Thomson wouldn’t make a decision one way or the other following an emotional defeat, but for now he will take some time to think about what comes next. The truth of the matter, according to the former Strikeforce champion, is that the close of his career after Saturday was a distinct possibility whether he won or lost. "I had this all in my head. A 15-, 16-week camp will really get to you. I’m no spring chicken. I just love this sport. It was kind of coming up before the title fight was offered, a little bit. There’s a possibility (I would have turned down the title shot) because what’s the point of winning the title if you’re not going to be fighting much longer? I don’t want to do that to the UFC either."